WinVIC is software based fully function real-time controller that can operate either as a standard three-term (PID) controller or implement general Direct Digital Control (DDC). Its built-in trend-recorder removes the need for any further recording hardware. 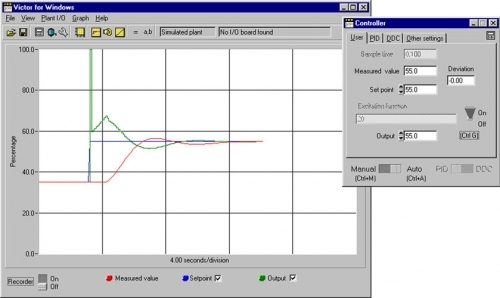 The package may be used either in “Emulation” mode where typical process plant behaviour is simulated in a realistic manner by the program, or in External mode where WinVIC controls an external process via an analogue interface card. The highly optimised and efficient code allows sample times as low as 14ms to be employed, so that relatively fast systems can be controlled on-line. When WinVIC is used as a DDC device, the control law is specified simply as a z-domain transfer function. The controller transfer function, Gc (z), is simply entered in free format. Thus it is very simple to prototype and test DDC algorithms that have been developed. WinVIC helps you to modify and adjust controllers with the minimum of difficulty before implementing them in dedicated systems. WinVIC is a valuable supplement in teaching digital control and it is an excellent tool for projects and research.